"Grandpa and Grandma’s kitten named Max had been hiding the day before, frightened by the talking, laughing, and footsteps of a house filled with family." Nathaniel is a young child riding with his parents to visit his grandparents and extended family. Though he is typically shy, Nathaniel’s constant stuffed animal companion Simba the Lion gives him the confidence he needs to meet and play with cousins that he rarely sees and scarcely knows. 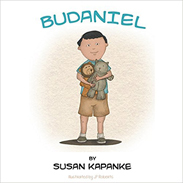 After having lots of fun, receiving a new nickname of “Budaniel,” and forgetting his shyness, Nathaniel is offered some quality time with his grandparents after his aunts, uncles, and cousins all leave. When it gets to be time for bed, though, Budaniel is shocked to discover that Simba has gone missing. Concerned that maybe one of his cousins packed him up by mistake, Budaniel’s parents scramble to either find Simba or purchase a replacement, but Budaniel instead makes a new animal friend—and this time with one that can play back. Children often attach themselves to beloved possessions that can wear down, break, or get lost. Having a story on hand like this that combines both the initial stage of sadness, the promise that something else to love will come along, and a happy reunion offers young readers the knowledge that things will work out one way or another. The book is structured perfectly with text on the left side and a soft, pencil-drawn illustration on the right, showing Budaniel with his family, the cuddly kitten Max, or whatever else is happening. This way, children learning to read can still follow along even as they learn new words. This is a short, happy story that children will be able to understand and apply to their own situations, whether their favorite object is a stuffed animal, a blanket, or even a family pet.